Stripped of his title and separated from his wife (Nazanin Boniadi) and family, Ben-Hur must endure years of slavery on a galley at sea. When fate brings the estranged brothers to an epic and deadly chariot race, Ben-Hur finally gets the chance to exact vengeance on the man who destroyed his life. “The Chairman” – The remake of the Charlton Heston classic with all the majesty of CGI horses and plenty of Jesus cameos. Just a quick question, who has been asking for Ben-Hur to be remade?! And if you are fool enough to attempt such a feat, it should be set in a more contemporary environment, like Baz Luhrmann’s Romeo & Juliet. I could actually see this movie being made with the shroud of terrorism. Moving to the movie I saw, there will be a few SPOILERS here and there, so you have been warned. A rich, selfish prince and his step-brother (Roman orphan) are fated to collide on the grandest scale that the Roman Empire has ever constructed, the Chariot Racing Circus, where the pride of Rome is laid bare. Judah Ben-Hur is spoilt and selfish, his only redeemable quality is the love he has for his family especially his half-brother Messala Severus, a Roman orphan who has descendants that are linked to the overthrow of Julius Caesar. This is ‘veil’ that he finds impossible to shake and is branded as a potential traitor. Toby Kebble was excellent, I would say he stole the movie. The most sympathetic villain you are likely to encounter, Ben-Hur rather forces the conflict between them by trying to play nice with all sides. The Roman Empire is portrayed as a cruel conquering force, willing to step on everyone to expand. While Messala Severus kills during the course of the battle, he prefers pacifying the locals instead of killing them, which really rubs his fellow Romans the wrong way. Now to the elephant in the room, this movie’s promos are a bit of a lie. This is actually a movie about Jesus that happens to have Ben-Hur in it. Jesus makes four appearances throughout the movie leaving lessons for Ben-Hur to follow. This story line isn’t handled very well and comes off as a bit forced. Ayelet Zurer plays Ben-Hur’s mother and plays Superman’s mother, seems like an ill-fated curse to be her child. 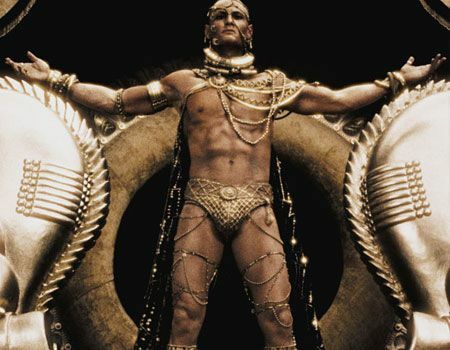 Rodrigo Santoro plays Jesus and plays the God-King Xerxes, cough cough IRONY.